Lovely jacket. Your creations are classic beauties and your blog is so informative. Even if I never become nearly as skillful as your are at making beautiful clothing, I am inspired by your blog. As usual, beautiful project and great post. Thanks for sharing your thought process. I learn something every time. Thank you for your kind compliments, Barbara! I am so glad you find my blog helpful. Beautiful, well fitted jacket which you do with great skill. I also appreciate learning about your process. Thank you. Thanks, Pat! I am continually learning with these jackets, which make their construction very interesting! Gosh, that’s gorgeous! The texture of your buttons reflects so perfectly the texture of your fabric and the rippledy fringe. Your tips are as inspiring as your finished jacket. I’m glad your chilly weather enables such lovely workmanship and a chance to wear your lovely makes. We’ve had way too much heat way too early even for this region. I used to prefer the heat and dread the cold, but between weather’s extremes and your inspiring makes, I’m beginning to change my mind. Happy new jacket wearing, and happy almost spring to you! Thanks, Mery! I must admit I do love winter clothes – until Spring arrives in full bloom and then I like Spring clothes and … well, you get it! It’s nice not to get bored with one’s wardrobe – and to be able to look forward to the changing seasons. Just lovely! And you were right to take that leap of faith with the ‘fluorescent’ orange, as it definitely makes the trim pop. I love the fit from the back. 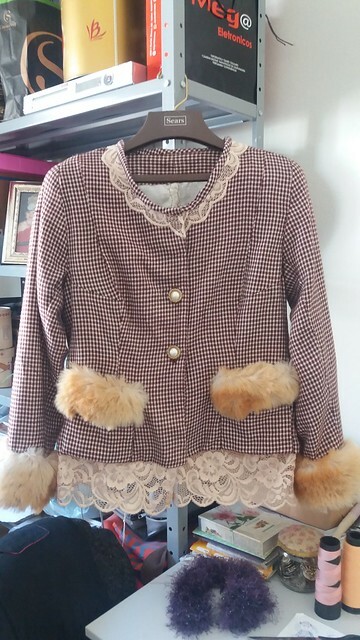 Such a lovely jacket! Thank you! When that trim arrived in the mail, I never would have guessed that it would actually work, but it does! I so enjoy following your sewing projects. My skills are not so finely hewn And it is wonderful to pick up tips along the way. A dear friend many years ago taught me to add half an inch at the CB and yes it does improve the line. I love this jacket and your fringing finish – simply perfect. Thank you for adding detail of the construction process. Thank you, Cheryl. I so appreciate your kind comment. I think I will always add that half inch at the CB, even if it is a regular jacket. Just wonderful, and that’s so much for sharing the trim steps, it is a great lesson in how colors can change things, quite amazing! Thanks, Kathy! I was very amazed that the bright orange turned out to be what I needed! Lovely and I like the strong colors! Great work! And thanks for sharing. Your jacket is lovely indeed with these colours, I heart this combination. And not to mention the matching earrings. Very elegant and pleasing the eye. I have used some of your tips while sewing my two, partially Chanel-inspired jackets. Thank you! And what is curious one always finds their little tricks here and there that suit best. These are lovely and unique, Nadeja. Thank you for sharing! It’s very kind of you, thank you! Thanks so much for your comment, Nadejda, and good for you for noticing the earrings! Love your jacket. Making one myself. Can I ask where you bought your chain. Thank you, Debby. I buy my chains from Susan Khalje’s online store. She sells them by the inch, in brass or silver tones. They are the perfect weight and size for these jackets. I highly recommend them! Thank you, Debby. I live in a small town in Brazil and here there is that old, tiny shop where an elder lady, who happens to be the owner, is selling this kind of chain. As always, your projects are perfection. Mine for the year is still unfinished but as soon as I can take a break from sewing for an upcoming vacation, I hope to get back to it! Thanks, Cissie! I love vacations, but they always seem to wreak havoc with my sewing plans. Have fun – and yes, you will get back to your jacket. They wait patiently for us. Last night at midnight I saw your post. The new Chanel is done! I needed to get off the internet and go to bed, BUT not without taking a quick look. So down to the bottom of the post to see you model your latest creation. BEAUTIFUL! This afternoon just went back and read (soaked up) all your construction details. Wonderful info for my upcoming Khalje retreat in June. Can’t wait. Thanks for another special post. LOOKS FANTASTIC! Thank you! I am really delighted that it is finished and that I feel good about it! Sometimes when I work so long on one thing, I start to see every little blemish or loose thread. Comments like yours make me feel great! You will be so amazed at the process when you take your class with Susan. I think I’ve already said this to you, but I’ll say it agin – I’m excited for you! Beautiful! I love the details you put into your creations! Thank you, Linda! That’s lovely to hear! Another breathtaking jacket! I would never have guessed you used bright orange as part of the trim. Beautiful result! Thanks, Marianne! I think I am still getting used to the idea that I used that bright orange as part of the trim! My apologies for the late comment to your posting. You are an inspiration! I will now return to my current project where I’m struggling! I wish you had a “sewing hotline”. I am impressed with your eye for color and sense for textures. I will follow your example in waxing and ironing my thread! Great technique. My thanks to you for showing all of your followers that perfection can still be achieved. No apologies necessary, Peggy! I have had many a project where I have struggled, so welcome to the club. Not so sure about perfection achieved – but it is something we all strive for, isn’t it? It looks great. Good tips. I have another jacket on the cards for later this year – only my second though! Thanks, Anne! Happy Sewing on your second! So beautiful! I’m in the process of making my first French Jacket (following Susan Khalje’s terrific video class). I have found your blog very helpful and have enjoyed seeing and reading about all of your jackets. All so lovely and unique. Thank you, Bernice. Susan is such a terrific teacher; her videos are so well done that one feels like they are taking a private lesson with her! Best of luck with your jacket!